Size	Ladies Case Material	Stainless Steel Dial Color	Mother of Pearl Bracelet/Strap	Alligator/Crocodile Leather Grey Clasp Type	Deployant Clasp Movement	Automatic Screw Down Crown	No Crystal	Scratch Resistant Sapphire Case Back	Transparent Water Resistant	30m/100ft Case Diameter	35.5mm X 43.75mm Case Thickness	9.45mm Polished stainless steel case with the signature Breguet "coined edge". Natural mother-of-pearl dial Offset hour & minute hands, With segmented hour zones & applied polished steel diamond-shaped hour markers. With over-sized 6 & 12 hour markers printed in black with a fine silver outline. Blued "Breguet" Style Hands. 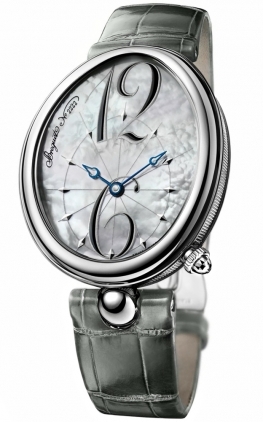 Breguet Caliber 591c, which beats at 28,800 vph, contains 25 jewels & has an approximate power reserve of 38 hours. Есть вопросы по Breguet Reine de Naples 8967ST/58/986. ?